SVTs! Blessing or curse? Barometer or ailment? These are the questions which have accompanied me on my life’s journey. A native New Yorker, born and raised in The Bronx and now a resident of New Jersey, I’d like to share my timeline which includes some things I’ve learned in dealing with SVTs. 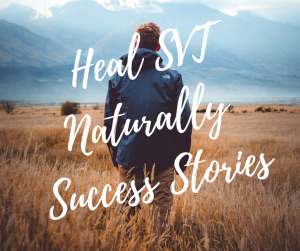 “SVT symptoms should be addressed and not ignored”: I have continually battled SVTs throughout my entire life. In my adolescent years, I interpreted SVT episodes as ‘just nerves’, but eventually in my teenage years, the anticipatory anxiety bred by these SVTs led to and became masked by overriding panic attacks. The SVTs, accompanied by a panic disorder, became the fabric of my daily life spanning my college years and the following twelve years of working for AT&T. “SVTs do not have to impinge on accomplishments”: Despite the ongoing battle with panic and SVTs, I did manage to attain some success: at AT&T, attaining the level of Research Division Comptroller; and in academia, by completing both Graduate and Post-Graduate degrees respectively in Statistics and Management Science. “Stay positive in the understanding that experiencing SVTs may serve a larger purpose in your life”: After twelve years at AT&T, I decided to leave workforce because I could no longer simultaneously cope with SVTS and perform at the required level demanded by that type of environment. I began a new career in music composition, arranging, and producing which allowed me to simultaneously deal with SVTs as well as my work. (Music had always been a passion in my life beginning with guitar lessons at the age of eight, and playing with Bronx based cover bands for the next twenty years). To obtain the necessary tools for my professional work, I attended music programs at The New School for Social Research in Greenwich Village, The William Paterson University Jazz Program, and The Juilliard School of Music’s Evening Division. Gaining the necessary proficiency in the musical field, I proceeded to build a home recording studio, write and produce songs for artists, score movies and videos, and in my current years write and record songs for non-profit causes such as Autism, Cancer, Alzheimer’s…which may be heard/viewed at https://www.youtube.com/user/pamark6 . Initially, I may have viewed SVTs as being a curse, but in the end it turned out to be more of a blessing; a catalyst for me to resign AT&T, and start up my own music production company, Pamark Productions. The first method was Biofeedback training. This technique allowed me to monitor and control my body’s reaction to outside stressors. Another method was in the application of Cognitive Behavior Therapy. This area of psychology allowed me to use an introspective approach to deal with any ‘negative’ emotions or maladaptive responses I might have been applying to my daily interaction in life. Another was in Meditating on Spiritual Readings. This made use of meditation on scriptural readings of world religions which all share the common messages of love, forgiveness, selfless living, a personal relationship with God, and a diminished focus on materialism. And another was Proper Nutrition. Positive results of blood work to test for food allergies pointed to a wide variety of foods as possible stimuli to my SVTs. A continued search down this path led to the fact that foods containing gluten were the main culprit in bringing about STVs. Another method was a Proper Exercise Schedule and Routine. I joined an affordable, local gym and on alternating days worked a regimen of light weight exercises, stretching, and stationary bike riding to provide for my body’s need of endorphins. Thank you so much to Mark for writing this incredible article. I decided to re-run it for all the new people in our Heal SVT Naturally community to see. 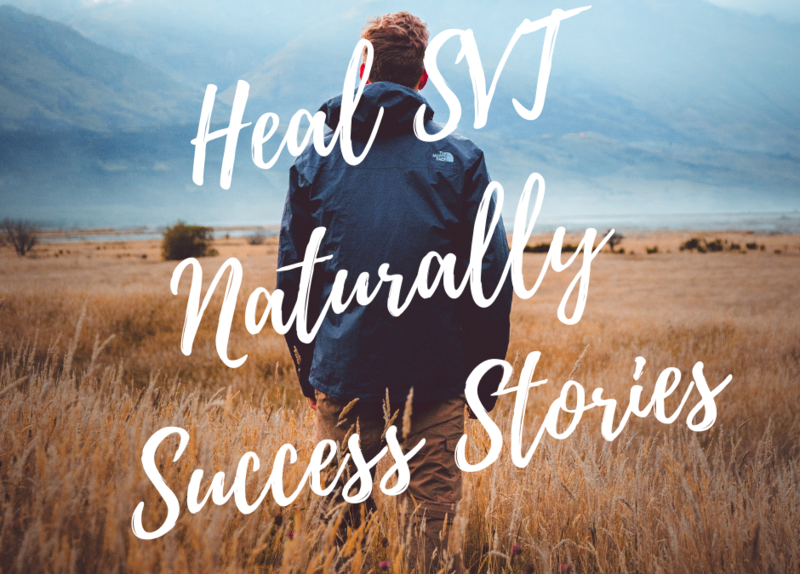 I hope you will take advantage of the HEAL SVT Naturally RESOURCES I design to help you take back control of your health and your life. They are listed below. Thank you for giving me the definitive view of my SVT episodes. I now go from a frightened view to one of hope. I have tried to access your guide but can’t using my desktop. Could you send me a hard copy with payment being made in advance? If ok send details and I will arrange it.